These sourdough bagels have a little bit of instant yeast added so the crumb is soft but chewy. There’s a few ways to shape bagels, I prefer rolling them into a cylinder and them bringing the ends together to form a ring but other people like to make a hole in the middle and stretch it out to form a ring. These freeze really well and when you want one for breakfast, bring it down to the fridge, the night before. In the morning, mix together the ingredients for the starter. I like to do this in a Weck Jar as I can see the starter rise as the day goes. I can usually leave the starter to sit on my bench at room temperature for 8-10 hours. If it’s a really hot day, I take it into work with me where there’s air conditioning. If it’s a really cold day, I leave it in the oven with the light on. In the late afternoon when you’re ready to make bagels – mix all the dough ingredients with the starter in the bowl of a stand mixer and use the dough hook attachment to knead the dough for 7 minutes. If the dough is really stiff, add the extra 15g water. Too much water and you’ll end up with a really soft and hard to shape dough. I usually use the dough hook to bring everything together and finish off the kneading by hand so as to not wear out my stand mixer. The dough feels pliable but holds it shape. Shape the dough into a ball and place it in a lightly greased bowl. Cover and set aside for 3 hours. After 3 hours, the dough should be doubled in size and puffy. Punch out the air and turn the dough out onto a lightly floured surface. Divide the dough into 90-110g pieces and cover with a clean tea towel as you work with each piece. Take a piece of dough and flatten it with your palm into a rectangular shape. Starting from the long edge closest to you, tightly roll up the dough. Seal the seam into the dough by pinching along the length of the dough. Use both palms to roll the cylinder of dough back and forth to stretch it out a bit. Using your thumb, press down on one end of the dough to flatten it and then bring the two ends of the dough together. Wrap the flattened edge of dough over the other end to seal it into a ring shape. Place on a baking sheet lined with non-stick baking paper and cover with a clean tea towel. Repeat with the rest of the dough pieces. You’ll fit 6 bagels onto a standard baking sheet. Let the bagels proof for an hour. Preheat an oven to 220 degrees celsius (conventional oven). When you’re ready to cook the bagels, bring a pot of water to boil and add half a tablespoon of baking soda. Gently place two bagels into the boiling water and cook for 25 seconds on each side. Use a slotted spoon to remove the bagel and place it back on the baking tray. Repeat until all the bagels on one baking tray are cooked. Brush milk all over the bagels and sprinkle with sesame seeds. Bake in the oven for 10 minutes and then turn the tray and bake for another 7 minutes. Each oven is different so if they appear to be browning too quickly, you can take them out a bit earlier. When the first batch of bagels are almost done, boil the bagels from the second tray and then bake as above. 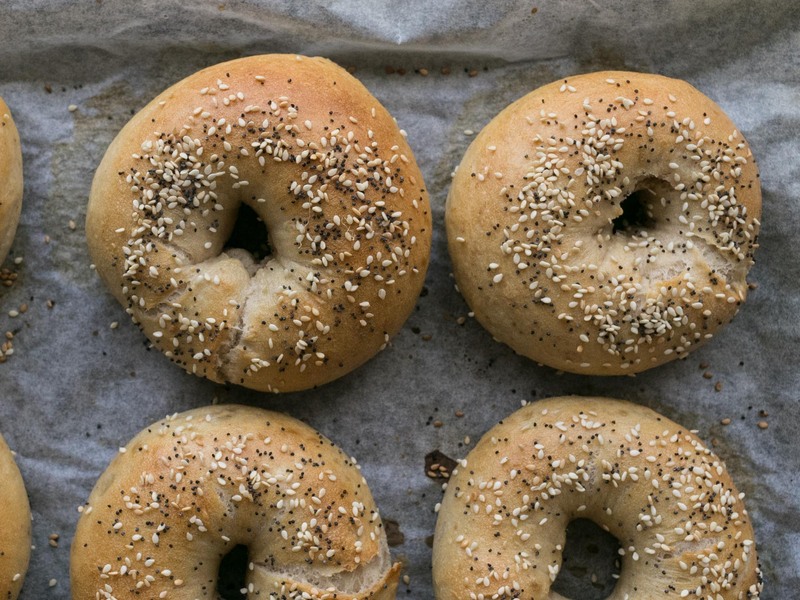 Allow bagels to fully cool on a cooling rack.